I have dry, sensitive and dehydrated skin and serums are an important step in my skincare routine. At night, I tend to stick to Estee Lauder Advanced Night Repair but for my morning skincare routine, I change it up a bit and like to try different serums instead of just sticking to one. 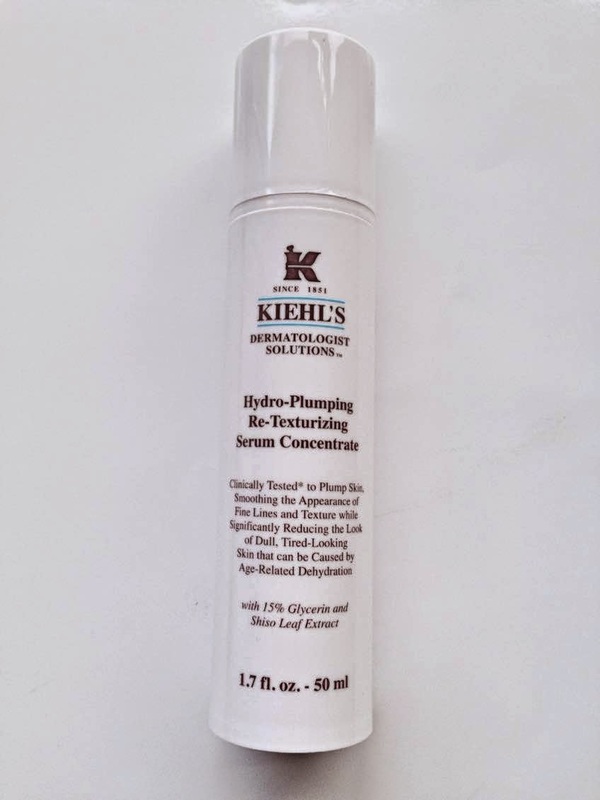 I have been using Kiehl's Hydro-Plumping Re-Texturising Serum Concentrate for the last four weeks and I want to share my thoughts on it with you today. The description says that it is aimed at reducing the look of dull, tired-looking skin and that is exactly what I am looking for at the minute. 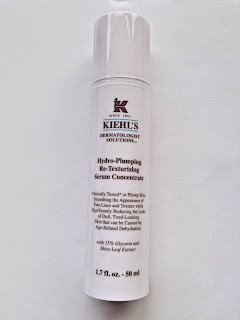 Kiehl's is a brand that is a bit hit and miss for me - I really don't like their Ultra Facial Cream but I love their Midnight Recovery Concentrate and I have had mixed experiences with other products from the brand too but I really liked the description of this serum so decided to give it a go. The texture of this serum is different from a lot of other serums that I have used. It isn't a watery serum and isn't very creamy either - it has a gel texture that sinks into the skin very quickly and easily and it feels quite cooling on the skin. My skin immediately feels smoother when I apply it but not necessarily more hydrated. It is the combination of this serum and my moisturiser that makes my skin feel softer, but the serum definitely makes it look plumper. It contains a high concentration of glycerine, which is known for moisture attraction and I have noticed that my patches of dehydration have cleared up over the last month, which I am really happy about. What I also like about this serum is that it can also be used on the eye contour area and it hasn't caused any milia, which I am really happy about because they are a bugger to get rid of! I still apply my eye cream on top of this serum, before applying my moisturiser and I have noticed an improvement in my under eye dryness also. Overall, I am very happy that I purchased this serum and can see myself re-purchasing when I finish it. It isn't the cheapest serum I have used, but not the most expensive either. I think it is worth its price because I have seen visible improvements and I have only been using it for 4 weeks. I can't say that I have seen a huge difference in the overall texture of my skin yet, but it has only been 4 weeks and it would normally take 6-8 weeks to see that kind of difference, but hopefully I will. If you have dry or dehydrated skin and are in the market for a new serum, then I would highly recommend this product. I'd love to hear what your favourite serum is? Have you tried any other Kiehl's products that you think I might like?